In addition to restoration and fabrication of artifacts and exhibitory for display, SpaceWorks has been privileged to have been instrumental in the recovery and conservation and/or restoration of some incredible pieces of history. Liberty Bell 7, piloted by Virgil “Gus” Grissom, ended with the craft lost at the bottom of the ocean for 38 years until a joint recovery effort by the SpaceWorks team and The Discovery Channel in June 1999. What followed was an intense collaboration between SpaceWorks, Cosmosphere volunteers and community members, who worked side by side to restore the craft to its original state. 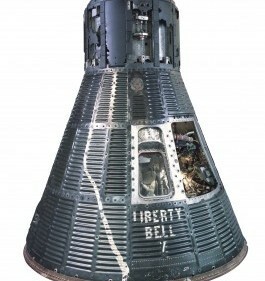 Liberty Bell 7 is part of the Cosmosphere’s personal collection and is the only Mercury capsule to be owned by an entity other than NASA or the Smithsonian. 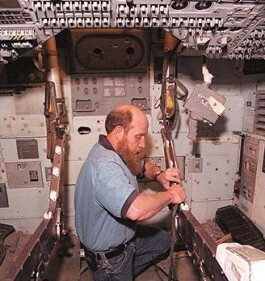 In March of 2013, Amazon.com Founder and CEO Jeff Bezos announced that he and his team of undersea experts had recovered many prime pieces of the historic F-1 engines from Project Apollo. 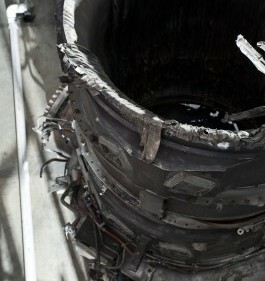 The expedition recovered enough major components to fashion displays for two flown F-1 engines, and shortly after their recovery, the Cosmosphere’s conservation team, SpaceWorks, began the process of stabilizing the engine pieces. The two-year conservation process was completed in the summer of 2015, having preserved the integrity of each piece for the future, while maintaining the history and beauty behind them. Upon splashdown, NASA recovered the Apollo 13 command module Odyssey – the craft housing the mission’s astronauts during their ascent and decent from Earth – from the ocean’s surface on April 17, 1970. Due to problems that plagued Apollo 13 and its crew, the mission was considered a “successful failure” and Odyssey was disassembled and its parts shipped to museums, manufacturers and space centers across the world. Years later, the Cosmosphere accepted the task of retrieving Odyssey’s 80,000 missing parts and restoring the spacecraft back to its original post-flight condition – a 12-year endeavor. The craft was restored in the Hall of Space Museum by the Cosmsophere’s craftsmen, in full view of museum visitors. Upon completion of the Apollo 13 project, the Smithsonian National Air and Space Museum granted the Cosmosphere a permanent loan to house the spacecraft. Odyssey is now on public display in the Cosmosphere’s Apollo Gallery in the Hall of Space Museum.